If the male advice for award-bait performances remains Tropic Thunder’s baldly offensive ‘Don’t go Full Retard’, the female version is surely ‘Go Full Ugly’, in the fashion of Charlize Theron’s Monster transformation. 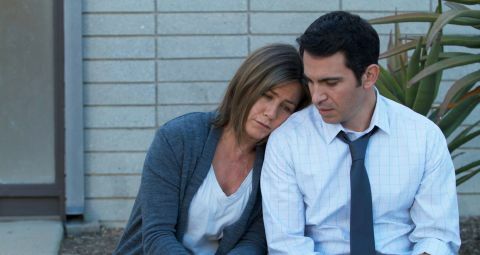 Yet despite a scarred and sallow Jennifer Aniston taking it on the chin looks-wise in this mordant indie drama-comedy about chronic pain, she has gained neither fright-status, nor a much-whispered-about Oscar nomination. That she’s astonishingly good though, won’t surprise those who caught her sensitive, dowdy outings in The Good Girl and Friends With Money. The problem here is that her wearily angry Percocet-gobbling pain victim Claire is pretty much the only good thing in the movie. Director Daniel Barnz is so infatuated with the sarcastic, self-absorbed Claire that he omits to build a proper plot around her. So Cake feels like a moody character study rather than a story, as Claire swaps her smug LA self-help group and nagging physical therapist for necking meds and flirting with suicide, after friend Nina’s fatal freeway plunge. Granted, there’s a sardonic Nurse Jackie vibe going on, and a sly subplot when the drugs repeatedly conjure up Anna Kendrick’s bitchy Nina-ghost, taunting Claire into rejecting life. But as Claire engages awkwardly with Nina’s widower (a low-key Sam Worthington), things take a sentimental turn. Earnest and underplayed to a fault, the film’s visuals look as bleakly tasteful and blue as its heroine. And dotting it with classy cameos from Felicity Huffman, William H. Macy and Adriana Barraza (Babel) makes it feel a tad top-heavy too. Nonetheless, Aniston carries the film effortlessly, conveying Claire’s ever-present pain and despair in her every wincing movement, and crushing a pharmacist’s contempt for her vast painkiller order with a mere curl of her lip. It’s a frankly delectable performance, unlike the rest of this slightly sickly offering.